This is a question that has intrigued me for some time now. Some people say this question is irrelevant or even that it should not be asked. But to me it is relevant, especially since Toyota seems to have been struggling with this question themselves. In April 2001 Toyota published a little booklet called “The Toyota Way 2001” to share its values. Toyota needed a way to communicate these values to an ever growing group of employees and the traditional way of conveying this implicit knowledge did not fit the new era of Toyota being a truly global company. In my quest to learn more about “The Toyota Way 2001” I searched for all the documents I could find about this topic. I found more information in the sustainability reports that Toyota publishes every year. While reading these reports I found that there was an inconsistency in the order in which Toyota references the two main pillars. Sometimes they would refer to the two pillars as Continuous Improvement & Respect for People. 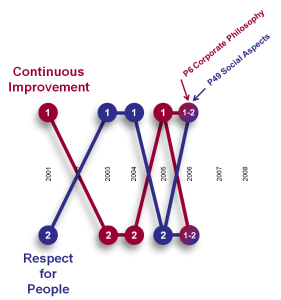 At other times the two pillars were referenced as Respect for People & Continuous Improvement. In 2005 the order was reversed once more to the 2001 order. The 2006 report was interesting: in that report I found both orders. 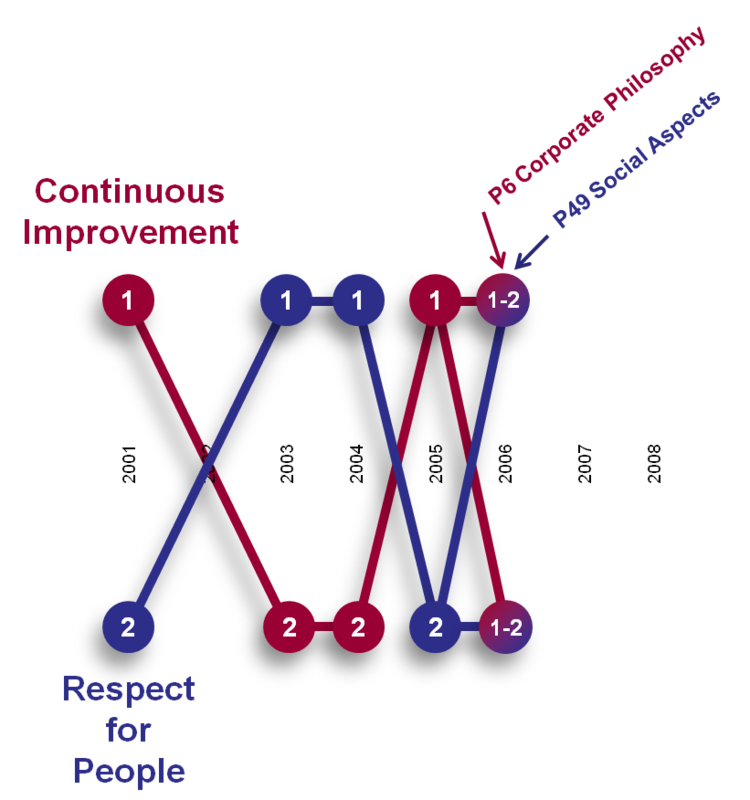 In the Corporate Philosophy section I found that Continuous Improvement was listed as the first pillar; in the Social Aspects section Respect for People was mentioned as the first pillar. Continuous Improvement is being mentioned consistently as the first of the two pillars. Toyota even calls Continuous Improvement explicitly their “first pillar”. So, I hope I made a case here, the question “what comes first” is a relevant one. There must be good reasons why from 2007 onward Toyota consistently mentions Continuous Improvement as their first pillar and Respect for People second. About 50% think it does not matter, both are equally important. So, I already learned that in the beginning the order for Toyota was not so obvious, at least not to everyone in the company. Now I learned that the order is not obvious for many “lean interested people” and also that most people take a different turn than Toyota took since 2007. I think that, in order to understand Lean better, it is important to understand “The Toyota Way 2001” better. 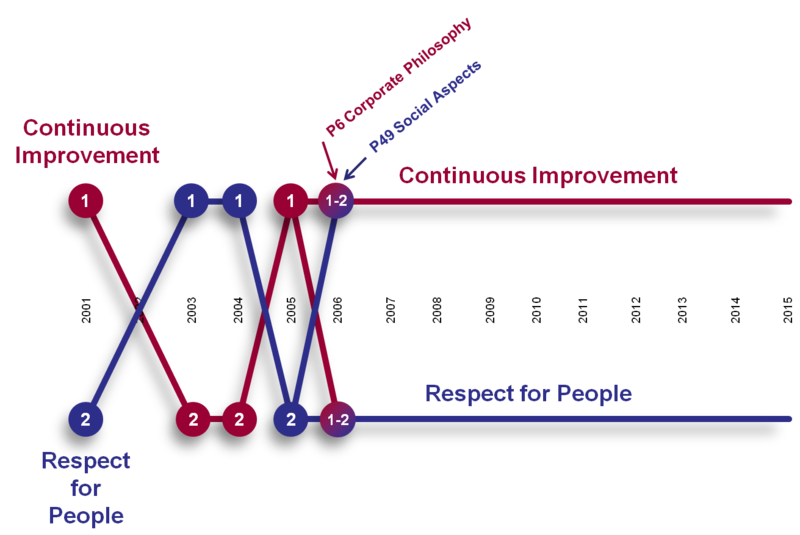 What I would like to understand is why Toyota now references Continuous Improvement consistently as their first pillar and Respect for People as their second pillar. There must be good reasons for it! Why do you think Continuous Improvement comes first? Continuous Improvement is broader. You can continuously improve the way you manage your human resources. Besides, by putting the Respect for People first, you might have difficulties in explaining redundancies or wages-freeze while the Company makes two-digit profits. In order to Foster Respect for People, you need to create an environment that is totally autonomous to allow or empower the people to solve problems through the Contiuous Improvement Philosophy. It’s the creative “Thinking Model” of Continuous Improvement that fertilizes the actions of the People, therefore recognizing and acknowledging them through respecting the Process, People, and The Production.